Vladimir Putin is paying a return visit to Budapest, a year after Viktor Orban’s trip to Moscow set the tone for enhanced bilateral cooperation. The two leaders, similarly unpopular in Brussels, are set to discuss current and prospective mutually lucrative trade deals. The visit comes during tense times between the EU and Russia, which is facing an ongoing sanction regime coupled with an unprecedented NATO troop buildup on its borders. The global geopolitical situation is, according to Hungarian Foreign Minister Peter Szijjarto, however, way more favorable than during Putin’s previous visit to the country in 2015. Putin’s first official trip in 2017 is set to bolster bilateral agreements reached during Orban’s February 2016 visit to Moscow. The two leaders are expected to focus on joint economic and trade projects, according to Kremlin. Putin and Orban will also likely discuss cooperation within the frameworks of the Nord Stream and Turkish stream gas pipeline projects, Russia’s presidential aide, Yuri Ushakov told reporters on Wednesday. About 85 percent of Hungary’s gas flows in from Russia. 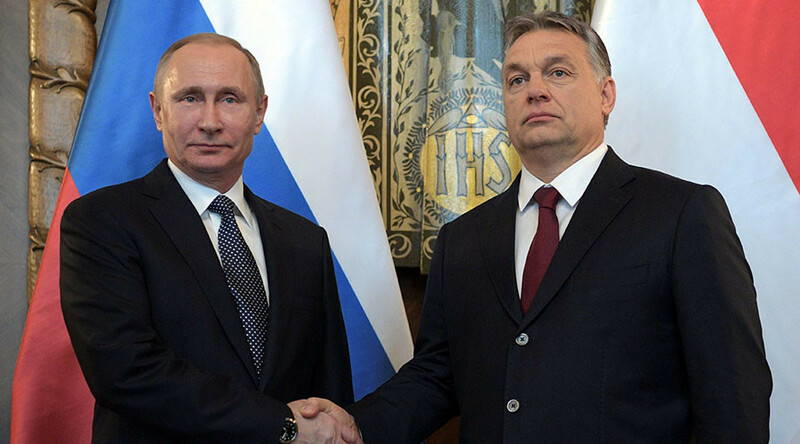 In 2015, Putin and Orban signed a new gas agreement replacing a 20-year contract that had expired in December 2015. Hungary pays only for gas it actually consumes under the agreement, which proved to be very lucrative for low-demand consumers. Another key issue, which is expected to be discussed during the visit is the expansion of the Paks nuclear power plant. Russia and Hungary signed an agreement on the construction of two additional reactors in January 2014. Eighty percent of the project’s cost will be funded by a €10bn credit line from Russia, and work will be performed by Russian nuclear scientists. Budapest is currently awaiting approval of the project by EU bureaucrats who have been blocking it. The Hungarian PM has been classed as the ‘black sheep’ of European politics because of his views on key EU issues, which frequently contradicts the mainstream establishment view. Orban’s skepticism towards the so called ‘open-borders’ policy and anti-Russia agenda has drawn criticism from many bigwigs on both sides of the Atlantic. The European Commission President, Jean-Claude Juncker, publicly greeted Orban as “the dictator” at the Eastern Partnership summit in 2015. While US Republican Senator John McCain even went as far as to brand the Hungarian PM a “neo-fascist dictator” in a December 2014 Senate address. Orban insists that he simply wants what’s good for his country, and that he “would not be a viceroy in Hungary commissioned by some foreign state.” His views on migration policy and desire to actually control his country’s borders proved to be quite visionary and realistic considering Europe’s migrant crisis. While Budapest went along with the EU sanctions against Moscow over the Ukraine, it has been criticizing Brussels’ anti-Russia stance ever since. Ahead of Putin’s visit, the Hungarian Foreign Minister reiterated that position. “Hungary's position on the [anti-Russian] sanctions is that [they are] useless,” Szijjarto told Reuters. In 2014, Orban said Europe “shot itself in the foot” as the sanctions policy “causes more harm to us than to Russia.” Szijjarto’s assessment appears to be spot on as his country’s economic losses amounts to billions of dollars.